Today, I want to share something very interesting which I believe many Facebook users that own Facebook Page encountered or currently facing but before we go down to the mean topic let me explain one or two things. A Facebook page is a public profile specifically created for businesses, brands, celebrities, causes, and other organizations. Unlike personal profiles, pages do not gain "friends," but "fans" - which are people who choose to "like" a page. Pages can gain an unlimited number of fans, differing from personal profiles, which has had a 5,000 friend maximum put on it by Facebook. How do I create a Facebook page for my business? From your Facebook profile page, click the Pages header in the left-side navigation. Next, click the Create a Page button, and select the type of page--Local Business or Place, for example, or Brand or Product. You'll see a number of fields to fill out, such as your business category, name, and address. How do you create a page on Facebook? Recently my business page was unpublished because it violates one or more of the Facebook Pages Terms. I cannot create advertisements for it. When I click the link to "Publish Page" nothing happens and my Facebook Page was only visible to me. Indeed i felt it because that is one of my main Facebook Page but all thanks to God because it was later republished after I did serials of research on how to Republish Unpublished Facebook Page. 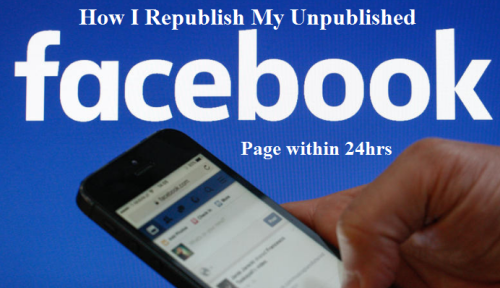 Below is the proceeds I followed to Republish my Unpublished Facebook Page. 1. I deleted all posts in my Facebook page. 5. 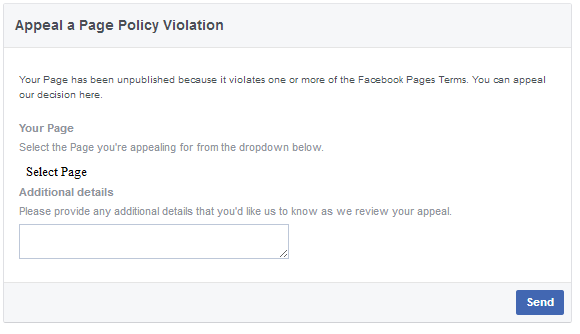 In Additional details box, please provide any additional details that you'd like facebook to know as they review your appeal. For me, I just notified them that my Page was Unpublished because it violates one or more of the Facebook Pages Terms and appeal for my Page to be Republish. That all, no much grammar. Note: You can only do this through the Facebook account you created the Page i.e you must be the “Admin” to the Page. You must not appeal more than more twice, if possible once. I hope these procedures I took will also work for you too.